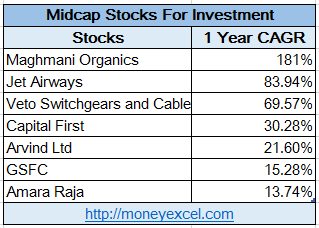 Midcap stocks had given a magnificent return in 2015. Even YTD performance of mid-cap stock is good. Market experts are of the opinion that midcap stocks will continue to outperform in 2016. It is advisable to invest in the midcap stocks which has a potential to become large cap. However, it is very difficult to identify these type of stocks. In order to help you here are 7 Midcap stocks recommended by leading brokerage house for 2016. These stocks are expected to give good returns in 2016. Meghmani Organics is midcap stock recommended by leading brokerage house Motilal Oswal. Meghmani Organics is agrochemical company dealing in manufacturing of pesticides and other chemical products. 57% of total revenue of the company is coming from export. Last year performance of this stock was extremely good. 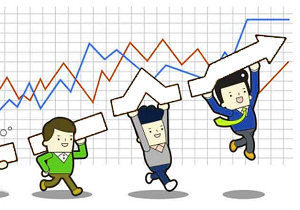 The stock has given a return of 180% to investors. Meghmani Organics has recently invested 560Cr to increase production capacity. Reduction in raw material cost and increasing product demand is a positive factor for Meghmani Organics. Jet Airways is midcap stock recommended by ICICI Direct. As per ICICI Direct there is room for margin expansion and growth for the airline industry. Jet Airway is very good performer stock of 2015. This stock could able to generate 83% return in 2015. Ace investor Rakesh Jhunjhunwala is also holding this stock in his portfolio. Reduction in ATF price and increasing demand are plus points for Jet Airways. Veto Switchgear is midcap stock recommend by Angel Broking. Veto Switchgear is in the manufacturing of wires and cable. Veto Switchgear is a regional company which is planning to expand business at international level. Veto switchgear has given a return of 70% in 2015. As per Angel Broking, one can invest in Veto Switchgear with a target price of Rs 150. Capital First is stock recommended by IndiaNivesh Securities. Capital First fulfill financing needs of the customer by providing them loans. Capital First is performing extremely well. CAGR of capital first in last five years (FY11-15) is 44%. Last year Capital First has given a return of 30%. Capital First is establishing itself as a very good player in the retail market. The company could produce very good return every quarter. One can plan to invest in this stock for long term perspective. Arvind Limited is stock recommended by HDFC securities. Arvind Limited has given very good returns in past 3 years. Arvind Limited is planning to become branded company from a pure textile company. Arvind Ltd has done a partnership with Sephora to enter in cosmetic and beauty business. The stock of Arvind Ltd has given 21% return in 2015. One can plan to invest in Arvind Limited with the target price of Rs.350. GSFC fertilizer and chemical sector stock is next recommended midcap stock by Angle Broking. GSFC growth is very good. Good monsoon season is expected to give benefit to this stock. In last year, GSFC has given 15% return. You can plan to invest in this stock for next year with target of Rs.140. Amara Raja Batteries is stock recommended by Religare Securities. Amara Raja is a market leader in manufacturing and distribution of lead acid batteries in the industrial and auto segment. The company is planning to expand capacity by an investment of Rs 600 Cr in FY16. The increase in demand in the replacement market & continuous improvement in financial performance is plus point for Amara Raja Batteries. Do you think that mid-cap and small-cap stocks will perform well in 2016? Do you know any other stocks which are outperforming and good for investment? « Credit card against fixed deposit – Good option? Kindly send me your articles as and when are published. Dear Sunil, Please subscribe to our post and you will get article as and when published.